“It must come sometimes to “jam to-day,””Alice objected. No need to worry, because it must be an “every other” day here! 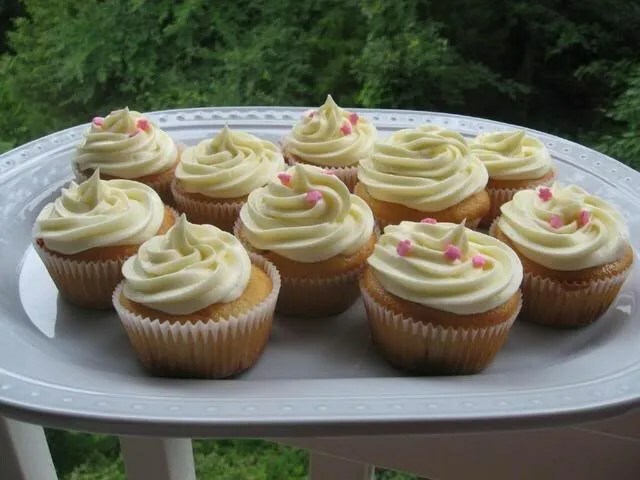 I made these Strawberry Jam Cupcakes at the same time as the Blueberry Lemon Cheesecake Cupcakes below, using the same batter with a few minor changes. The note at the end of this recipe will explain how to do that if you’d like to. Because of my aforementioned love of cream cheese, I decided to frost these with a smooth and creamy cream cheese frosting instead of buttercream. It was a great combination! 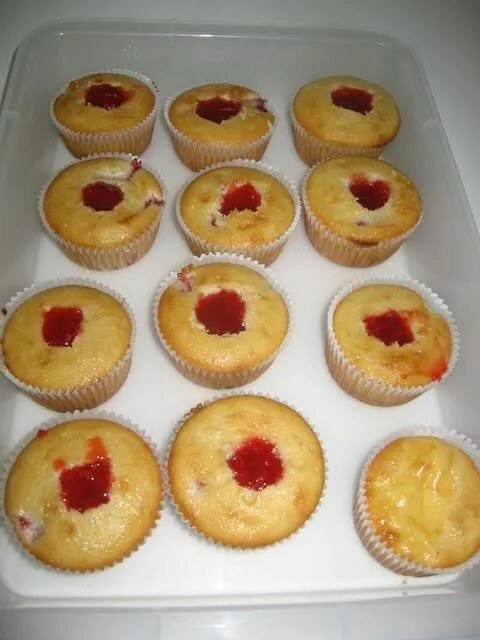 Strawberry Jam Cupcakes: Preheat oven to 350°. Place 12 decorative paper muffin cup liners into muffin cups. To prepare cupcakes, lightly spoon 1.5 cups flour into dry measuring cups; level with a knife. Measure 1 tablespoon flour; level with a knife. Sift together 1.5 cups flour plus 1 tablespoon flour, granulated sugar, baking powder, 1/4 teaspoon salt, and baking soda in a large bowl. Combine melted butter and egg in another large bowl; stir with a whisk. Add buttermilk, milk, and vanilla to butter mixture; stir with a whisk. Add buttermilk mixture to flour mixture, stirring just until moist. Toss chopped strawberries with remaining 1 tablespoon flour. Fold berries into batter. Spoon batter into prepared muffin cups. Bake at 350° for 25 minutes or until a wooden pick inserted in center of the cupcake part comes out clean. Cool in pan 5 minutes on a wire rack; remove from pan. Cool completely on wire rack. When cool, core a hole out of the middle of each cupcake. Spoon in fresh strawberry jam. That one lonely little cupcake on the bottom right got a dollop of cream cheese as an experiment — that’s why he’s jamless! 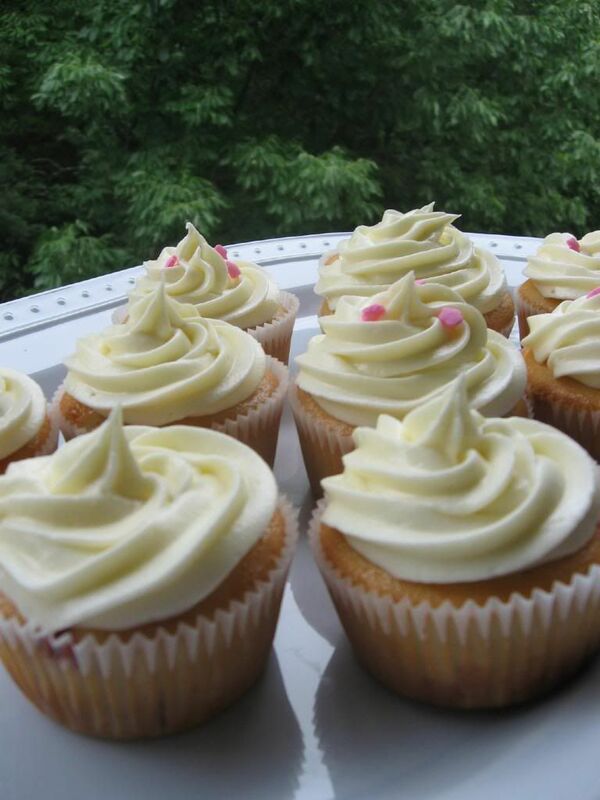 Cream Cheese Frosting: In a large mixing bowl, beat the cream cheese, butter and vanilla together until smooth. Add the sugar and on low speed, beat until incorporated. Increase the speed to high and mix until very light and fluffy. Frost completely cool cupcakes, using a pastry bag if available. I used star tip 1M. NOTE: Use fresh, homemade strawberry jam for filling if possible. See note at the bottom of Blueberry Lemon Cheesecake Cupcakes recipe for instructions on how to make these two batches of lovely cupcakes together. Pingback: Jammy cupcakes with mascarpone topping « Cake or Mistake? Thank you very much for the recipe, it’s definitely a success in mine and my friends books!